In the calendar of the liturgical churches, which includes the Lutheran church, tomorrow is Christ the King Sunday. It is the last Sunday of the seasonal church calendar, so that the “year” starts with the first Sunday in Advent. (More on Advent next week). In my little congregation of Community of Faith, this is a very special Christ the King Sunday for two reasons. First, it marks the end of our first complete church year as a new congregation. Second, and really more important, we will be installing our new permanent lead pastor, Pr. Dave Sorensen, as shepherd of our flock. We are really excited about having Pr. Dave come worship with and lead us. He is a man who definitely lives with Christ as King of his life, and that is so important in a pastor. 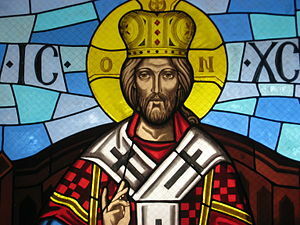 But you might be asking, what exactly is Christ the King Sunday and when did it start? This celebration, or feast, of Christ as King was first instituted in the Catholic Church in 1925, and has been adopted into the calendar of the Protestant liturgical churches as well. The purpose of the celebration is focus on Christ as King and Lord of the entire universe. He is not a king in the earthly sense of kings who often rule for their own benefit as tyrants. Rather, Jesus is a servant King who rules in the hearts and minds of those who choose to follow Him, and who calls His people to service toward one another. “But we have no right to execute anyone,” the Jews objected. This happened so that the words Jesus had spoken indicating the kind of death he was going to die would be fulfilled. I love that we end the church year with Christ as King. We begin in Advent by celebrating His coming as a helpless little baby at Christmas and then end the year with Him exalted above all the earth, having conquered sin and death on the cross, been raised from the dead, and sent His Holy Spirit to reign in the hearts of His people. His rule is one of love and mercy for the humble, but justice for the proud and wicked. He is able to rule lovingly and justly because He alone understands the heart of each person who ever lived. He understands our motives and our struggles. He knows that alone we are nothing, but that with His grace and through the power of the Holy Spirit we can be the kingdom He desires to rule. Is Jesus King and Lord of your life? Does He reign in your heart? Do you know the love and mercy of this wonderful Christ the King? He desires to know you, to love you, to show you mercy and grace. He desires to have you as part of His wonderful kingdom, a kingdom that transcends your earthly location or nationality. All you have to do is ask Him to come rule in your life. So what are you waiting for? Maybe this Advent will mark the beginning of the first full church year of your life in Christ. This entry was posted in Christian Living and tagged Bible, Celebration, Christ, Christ the King, Christ the King Sunday, Christian, Christianity, Faith, God, Gospel, Holy Spirit, Jesus, John, Life, Liturgical Calendar, Love, Mercy, postaday2011, Religion, Truth, Word of God. Bookmark the permalink. I agree with Debbie. Alot of this is new even though I was raised in the Lutheran church. My mom, however, loves church holidays and the familiar routine that goes with them. Interesting thoughts about communion. Not long ago I quit a chuch that only served communion twice a year, and then only to church members. It was like spraying a can of Jesus repellant all over the rest of us. Communion is too beautiful to be denied. Humbug. Thank you Linda! Another informative and worshipful post. There is so much that I don’t know, and this is one of the many things. I didn’t know about Christ the King Sunday. 🙂 What a blessing and I am excited as I think about going through the year with Him.